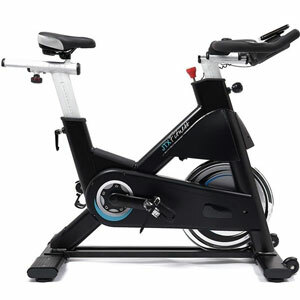 Many users will love this JTX Cyclo Studio Spinning Bike for the intense workouts and nice bonus features. The intensity of this spinning bike is a big talking point for buyers. This exercise bike boasts an impressive 22kg weighted flywheel to ensure plenty of resistance and a smooth ride. This combines with the strong steel frame for increased stability and greater peace of mind. 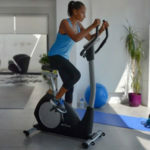 This allows experienced users to push this JTX Cyclo bike to their limits and get a great workout. The added benefit here is that use of infinite resistance. The idea here is that users can continually tweak the machine to their needs and grow with it. There is much more to this tough gym-ready bike than the motion and resistance. There are also some nice details in the design and functions to help users further. The first is the inclusion of the chest strap for the heart rate measurements. This replaces the pulse sensors in the hand grips, which JTX feel are unreliable when users work up a sweat. The use of the stainless steel finish means that the bike won’t tarnish after contact with the sweat. Also, there are two water bottles, not just the bottle holder, to ensure that users are hydrated as they work out. There is little to complain about with this JTX Cyclo Studio Indoor Cycle, as it ticks plenty of boxes for at-home spinning. There is a definite purpose and target market with this stationary bike. The intensity, lack of pre-set programmes and “do-it-yourself” attitude to the resistance are great for those that have the confidence to push forward and test their limits. However, newcomers may feel a little overwhelmed by that idea of “infinite” resistance and the general style of the machine. Even so, there are still user-friendly aspects there in the build and assembly. There is also the chance that some users may dislike the shape and restraints on the pedals, but that comes down to personal preference. Summary: does this all mean that this JTX Cyclo 22kg Cycle is highly recommendable? 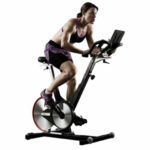 It is easy to recommend this spin bike to those that are experienced with this sort of machine. Those that have taken plenty of spin classes, and are already pretty fit, will appreciate the feel of this fitness equipment and the options from that tough flywheel. 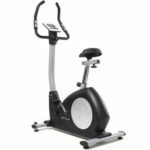 This JTX exercise bike is not an entry level gym bike at all, but it is a great tool for those that want to progress further with their workouts and training at home. 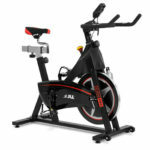 Find more reviews about the JTX Cyclo Studio Indoor Bike on JTX Fitness here.